Fruitless pear trees are trees that are used strictly for ornamental landscape purposes. At one time, the Bradford pear tree (a fruitless variety) was extremely popular as an ornamental tree. However, there were some major problems with the Bradford pear; during stormy conditions, the branches would break off due to the narrow crotch of the branches. The Cleveland pear tree, which also is a fruitless pear tree, was designed to improve upon the branch breakage problem of the Bradford pear. When the Bradford pear tree reaches an age of approximately 20 years the problem of limb breakage can be devastating in metropolitan and suburban areas because limbs are heavier and larger. During windstorms, rainstorms or snowstorms, falling limbs can land on cars, utility lines and houses, causing property damage as well as power failure. Although the Bradford pear tree is fruitless, the seeds can also become a problem. Seeds can be scattered throughout the area (as well as carried/dropped by birds), and Bradford pear trees begin to grow prolifically among other native species. Trees then begin vying for space and nutrients. The Cleveland pear tree was designed to have the beauty of the Bradford pear and none of the Bradford pear branch or seed problems. The shape of the Cleveland pear is more symmetrical/oval than the Bradford pear. The tree has beautiful, white spring blossoms, and the leaves turn dark red in the fall season. Cleveland pear trees do not have seeds, so seeds are not scattered throughout the area, and new (unwanted ) trees do not compete with other native species. The branches grow closer together so there isn’t a breakage problem during stormy conditions. These qualities make the Cleveland pear tree a good choice as an ornamental tree in landscape design. The Cleveland pear will reach a mature height of 30 to 40 feet, with a spread of approximately 25 to 30 feet. It should be grown in full sun to partial shade. 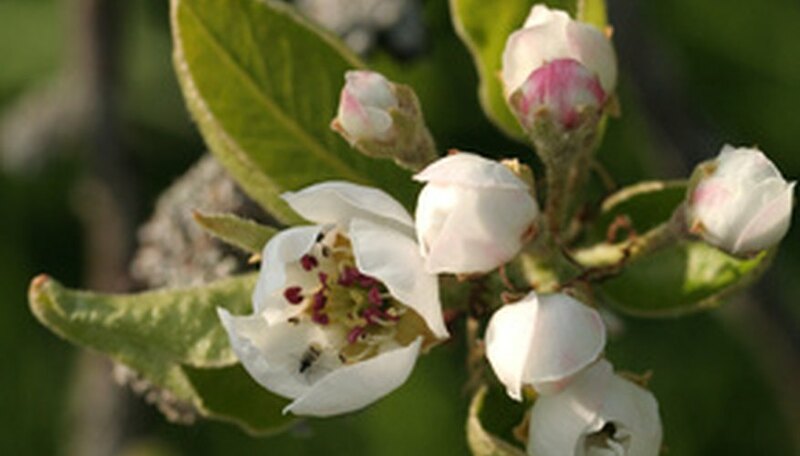 The Cleveland pear will adapt to most soil conditions, and it has good drought tolerance. It is hardy in zones 5 through 8. The best time to plant the Cleveland pear is in early spring or in the fall. The planting hole should be approximately twice the size of the tree’s root ball, with the top of the root ball slightly below ground level. Make sure that the tree is straight before filling up the hole. The tree should be watered thoroughly after planting. You can fertilize the Cleveland pear tree in the spring. Pruning should be done before the tree forms buds, and before the warm weather of spring arrives. This early pruning will maintain the size of the tree within your landscape design and keep branches away from buildings or walkways. You can prune dead, diseased or damaged branches at anytime throughout the year. How Fast Do Poplar Trees Grow? What Is a Bradford Pear Tree?